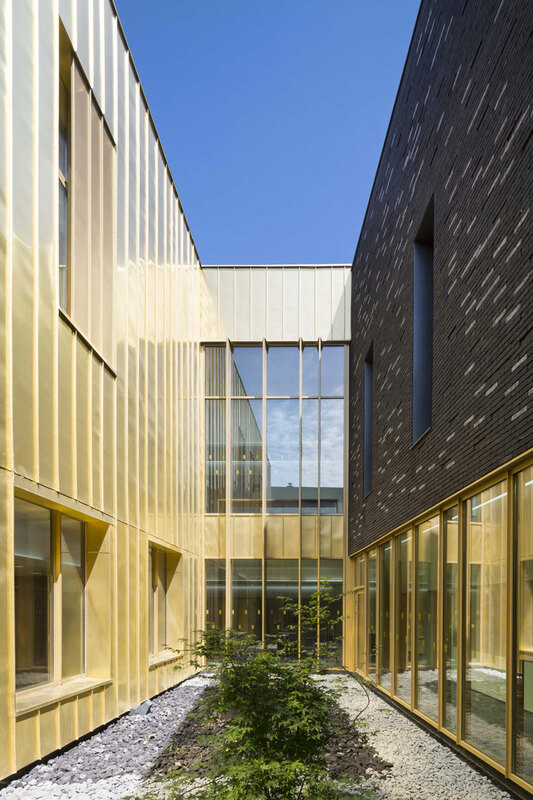 Located at a major crossroad within the city, this Music & Dance School is part of a wider urban regeneration project. 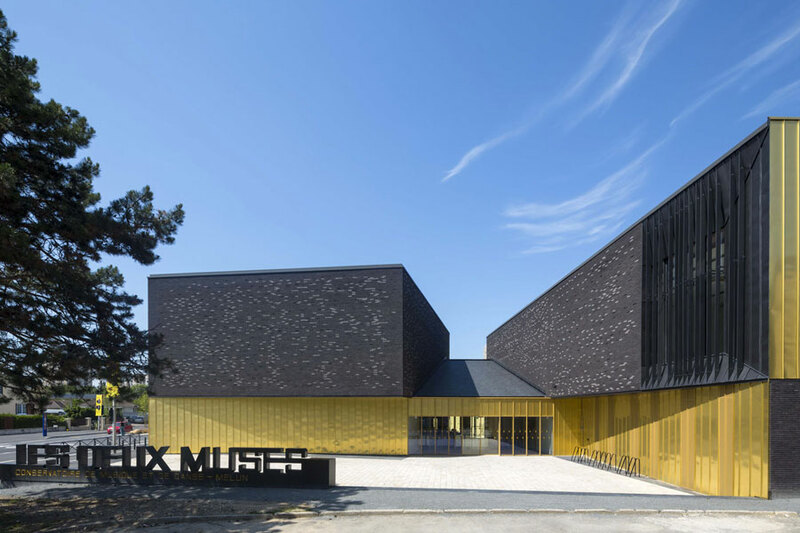 ‘The Two Muses’ as the building is called, allows the city of Melun to group together the existing music and dance schools which until now, were in two separate locations. 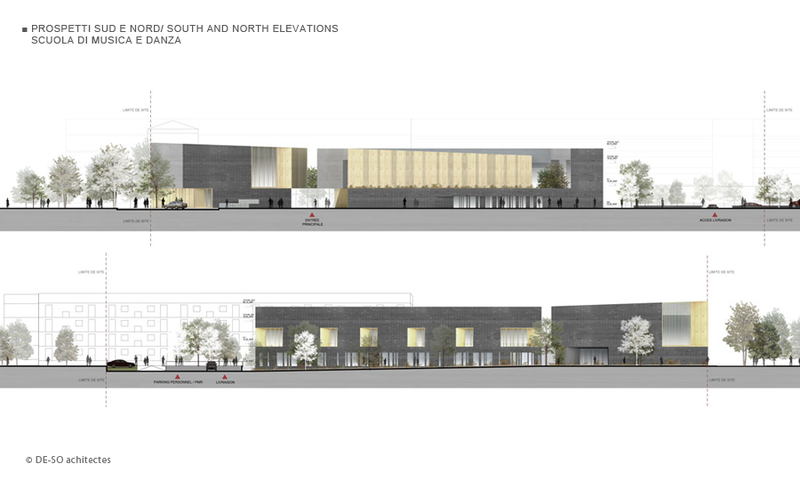 “42% of the city’s social housing is located in the vicinity of the new building” explains Renée Wojeik, the city councillor in charge of cultural affairs. 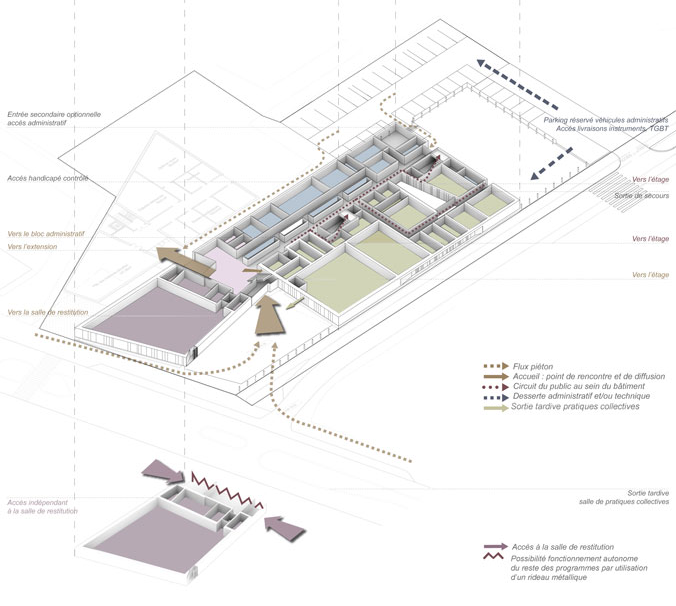 “We chose this location to encourage children from low level income families to discover music and dance”. The architects François Defrain and Olivier Souquet have sought to create a landmark in a somewhat loose urban fabric made up of public open spaces and a range of different buildings (suburban terrace housing and blocks of flats dating back to the sixties). 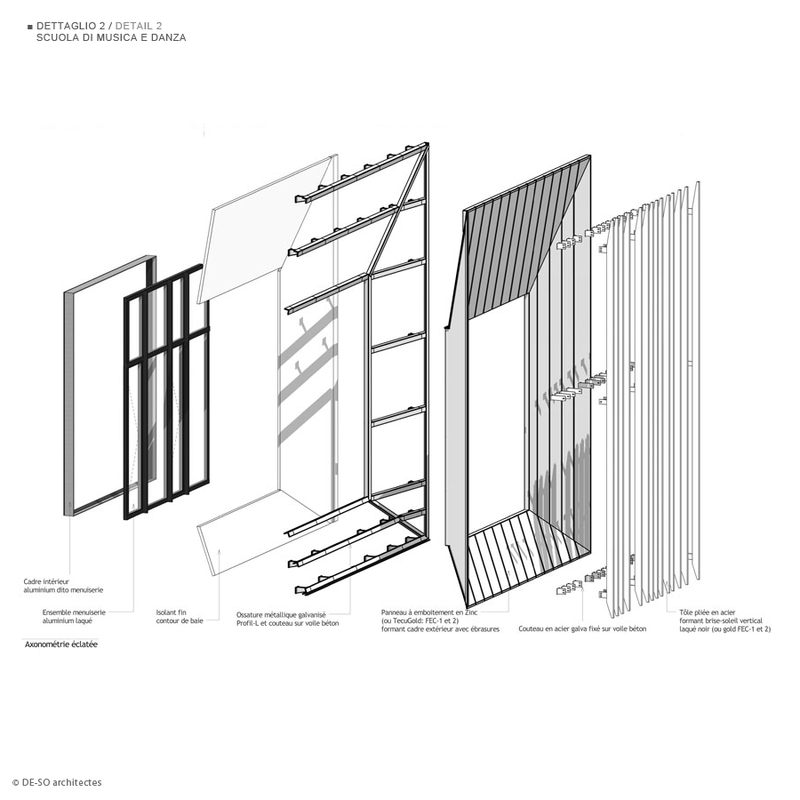 “We have tried to create a two faced building” explains Olivier Souquet ”rather like Janus the two-faced Roman god of gates, doorways, beginnings, and endings”. 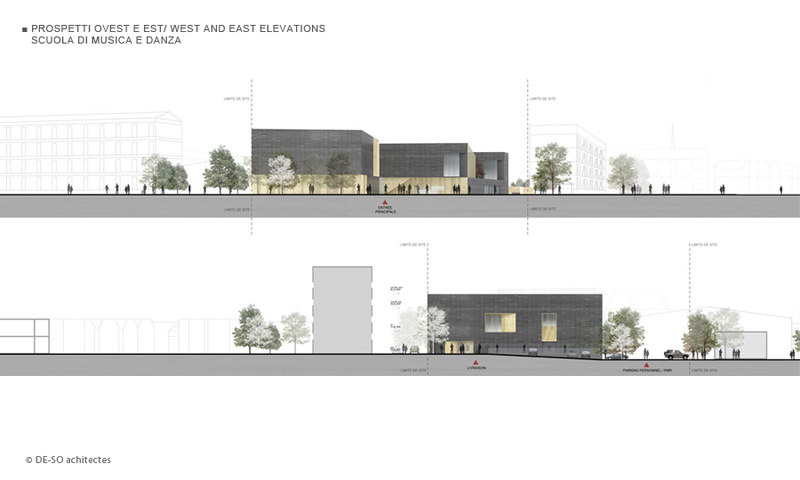 The taller building on the West side houses the multipurpose performance hall with a seating capacity for an audience of one hundred spectators. 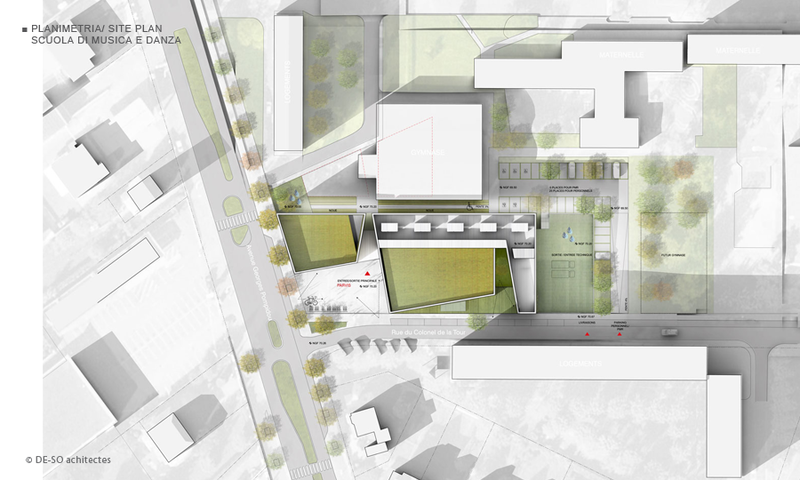 The large forecourt in front of this west wing marks the building main entrance, and links the building up with the neighbourhood and makes it easily accessible to its pupils. The longer but slightly lower East wing houses on two floor levels a number of classrooms, practice rooms, the school’s offices as well as two recording studios. 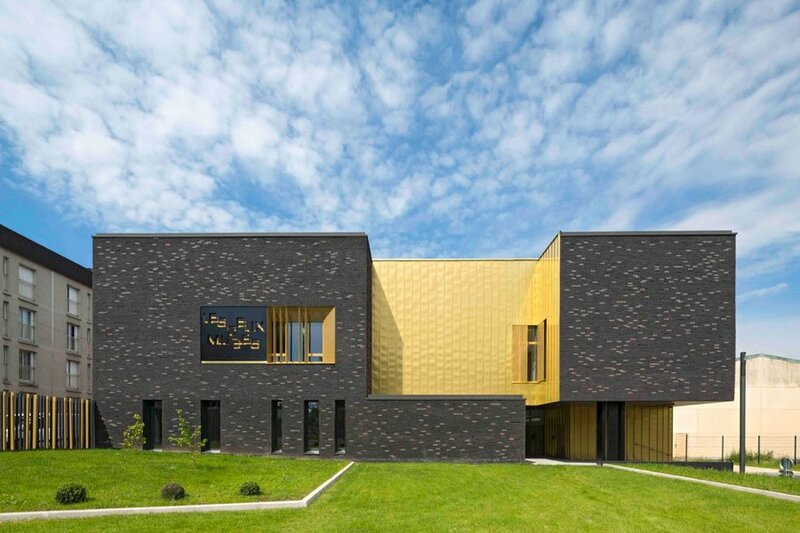 The building is also very striking from the outside because of the starkly contrasting materials used on the external walls: whereas the top section of the main walls are clad in dense, charcoal grey brickwork, the lower half is covered in warm golden copper alloy cladding (Tecu Gold). The shiny, almost fragile aspect of the copper alloy contrasts with the brickwork which has been densely set with hardly any visible jointing to give it the rough aspect of a dry stone wall. 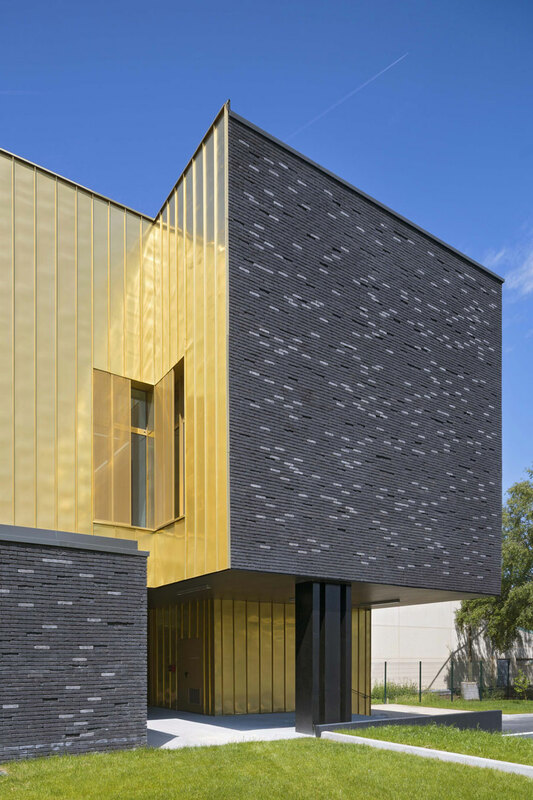 Speckled lines of light coloured brick create random horizontal patterns across the brick wall surfaces whilst the vertical ridge lines behind the copper cladding give a vertical rhythm to the other façades. 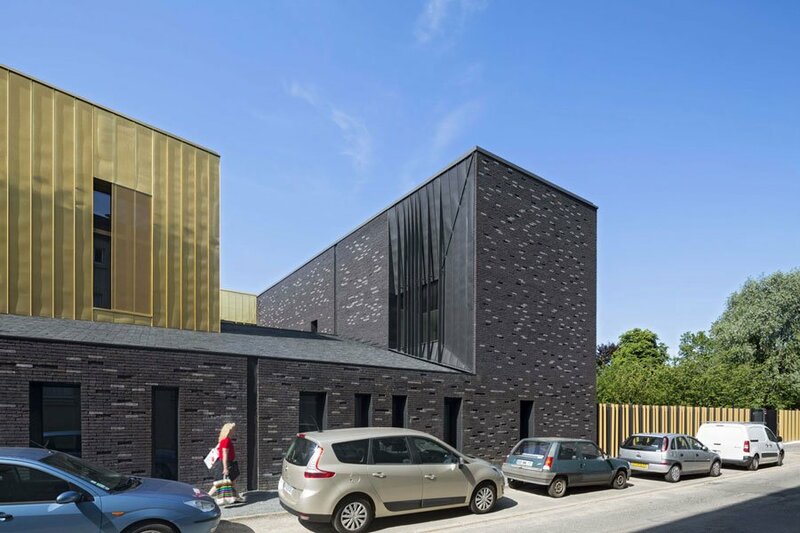 “Between the elegant restraint of its dark brick walls and the rich aspect of its copper alloy cladding the design intention is to make it look like a music box whose walls are punctuated by the variety of openings” explains Olivier Souquet. 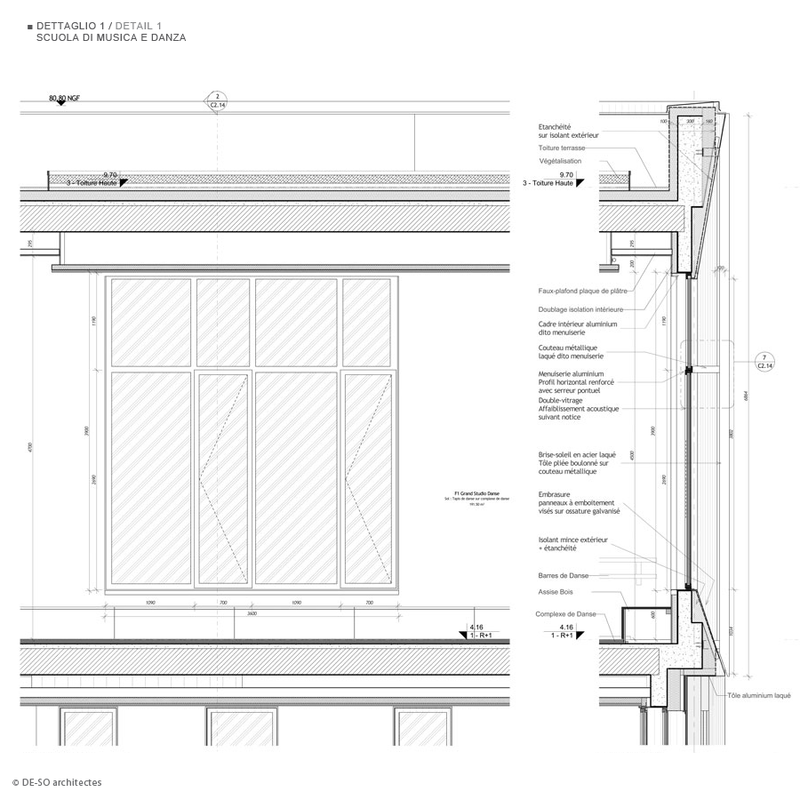 So, for instance the splayed window openings on the upper part of the building evoke the frame of a harp with steel sun blinds running vertically to look like harp strings. 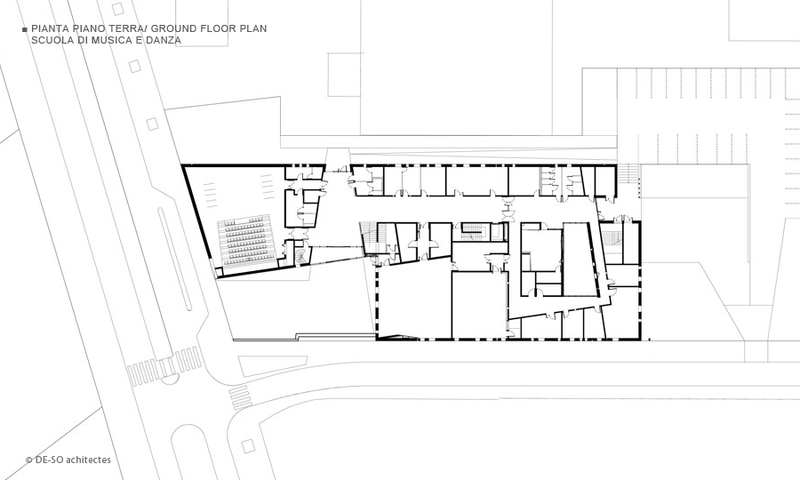 From the main entrance one penetrates into a central hallway that marks the junction area between the two separate wings of the building. 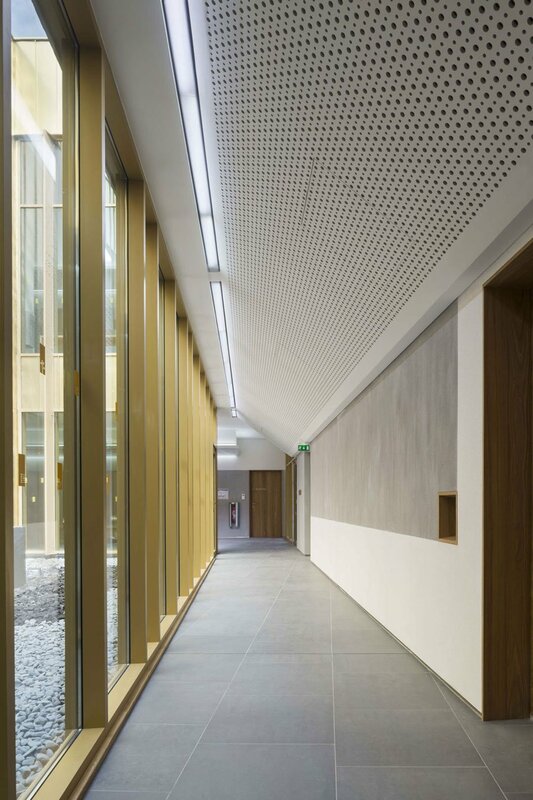 A full height glazed wall bathes the reception area with natural daylight. The sloping acoustic ceiling in white perforated gypsum panels accentuates the reflection of natural daylight. 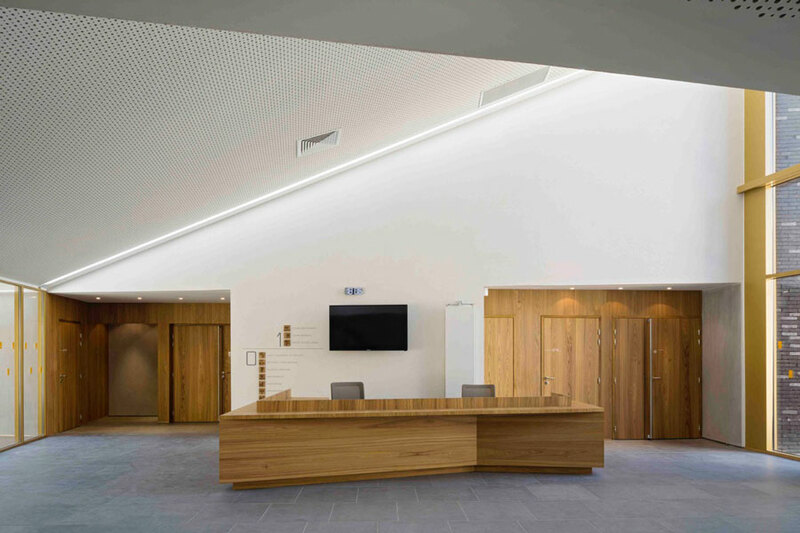 The sweeping horizontal vein patterns of the crown cut American red elm veneer are highlighted across the main reception desk. American red elm also features on the double doors leading into the performance hall but here the busy grain patterns run vertically and contrast with the plain dark grey stoneware flooring. The attention for detail is expressed again in the building’s internal signposting which is made up of icons engraved on blocks of American red elm. 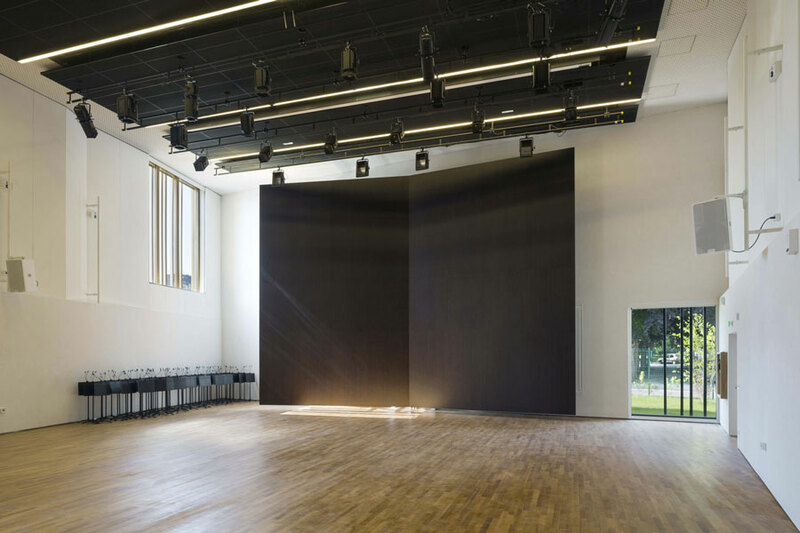 The performance hall is equipped with a traditional parquet floor in solid beech laid on flooring sleepers. The dark black acoustic shell at the back of the stage is made in special wood panelling with a natural oak veneer facing that is stained to look like wengé. On the other side of the entrance hall a wide gallery runs through the east wing of the building. 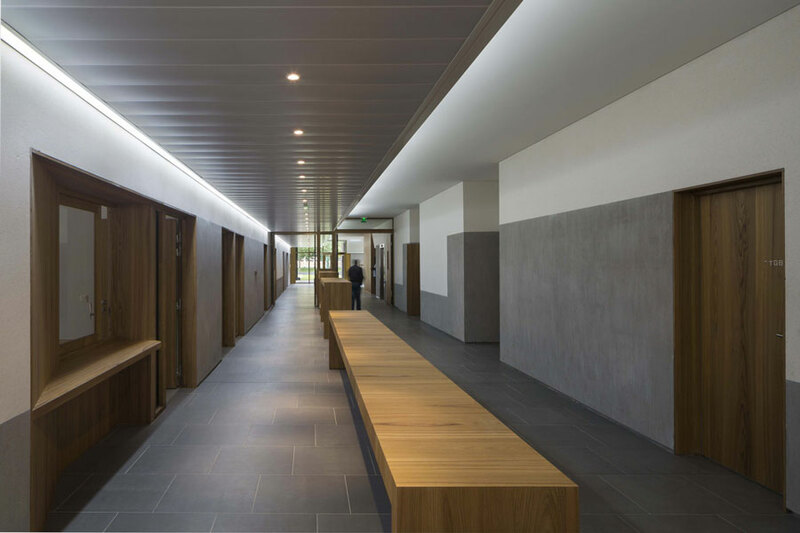 A long, solid oak bench provides a seating area for the parents whilst a row of furniture units visually separates the administrative offices on the left hand side of the gallery from the practice rooms on the right hand side of the gallery. The practice rooms on the ground floor are reserved for the younger pupils because they are more easily accessible from the main entrance. From the main gallery small passage ways lead to further practice rooms with double door systems reserved for louder musical activities. When you enter the gallery the first door to the left is reserved for the school secretariat. It includes again a splayed wooden window with a large window ledge to write on which is beautifully crafted in American red elm. 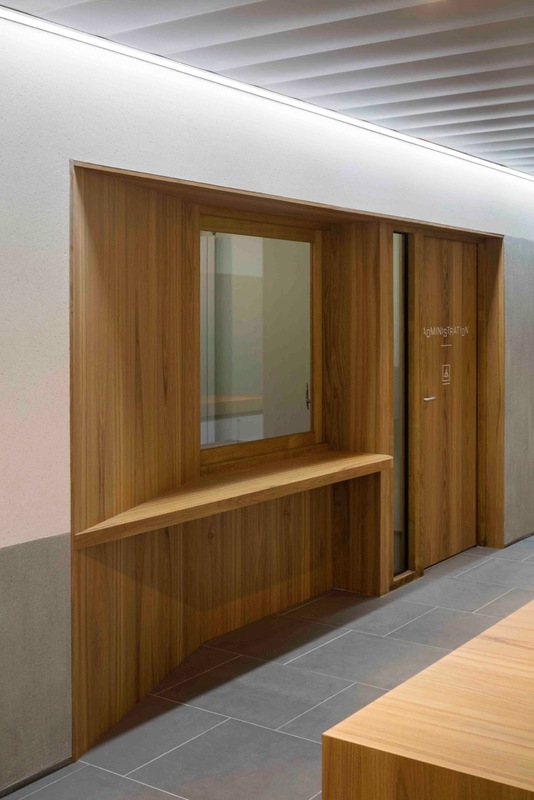 All the doors inside the building have laminated American red elm facing as well as the door frames which are set in to give volume and mass: the entire door facings on both floors represent a total surface area of 130 m². 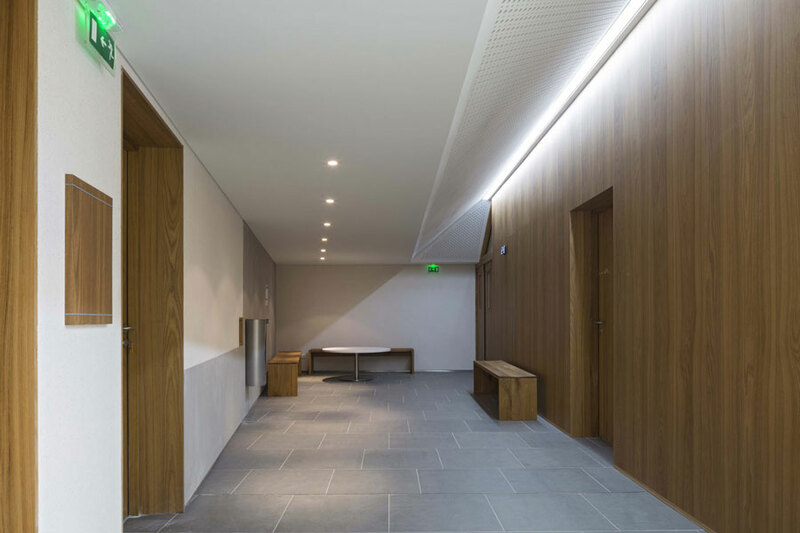 To create rhythm and variety the architects have alternated different shades of white and grey wall coatings between the doorways with full height wood panelling in American red elm crown cut veneer fixed on MDF panels in certain wall sections (110 m² in total). 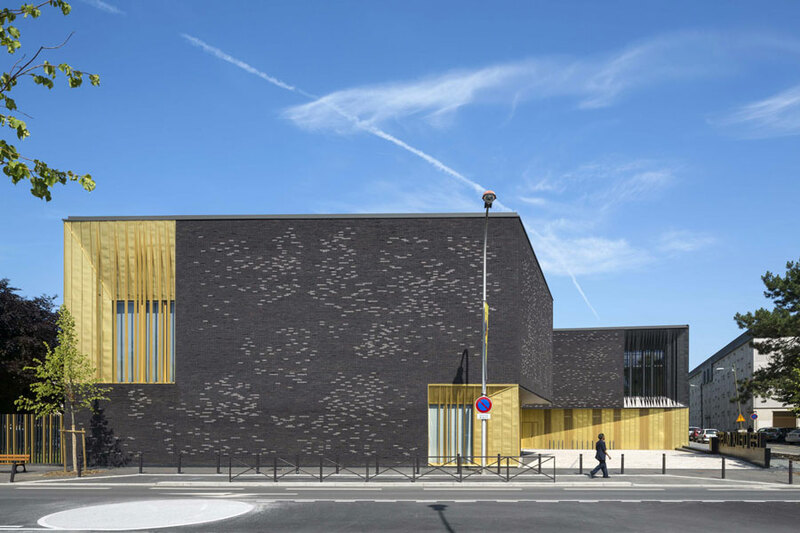 “This is the first time that we specify this wood species and we are very satisfied with the texture and warm tones it creates in the music school as well as its interlocking grain which is clearly visible” comments Olivier Souquet. The strip lighting runs along the top edges of the walls so as to create a subdued indirect lighting that creates soft shadows on the joinery work and stoneware flooring. 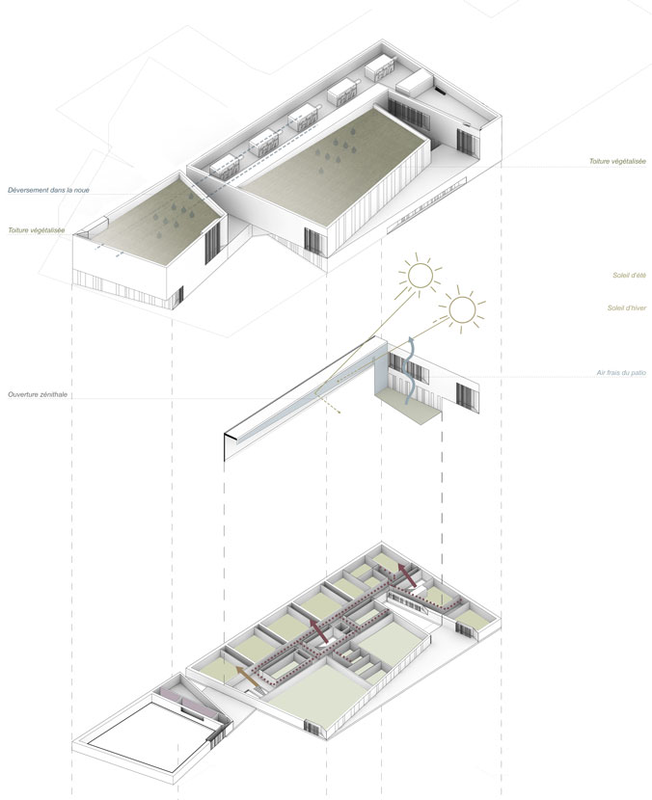 At the end of the gallery the architects have created a patio which brings more natural daylight both in the practice rooms on the ground floor but also in the dance rooms on the upper floor. The secret inner patio creates a quiet space within the building conducive to concentration. 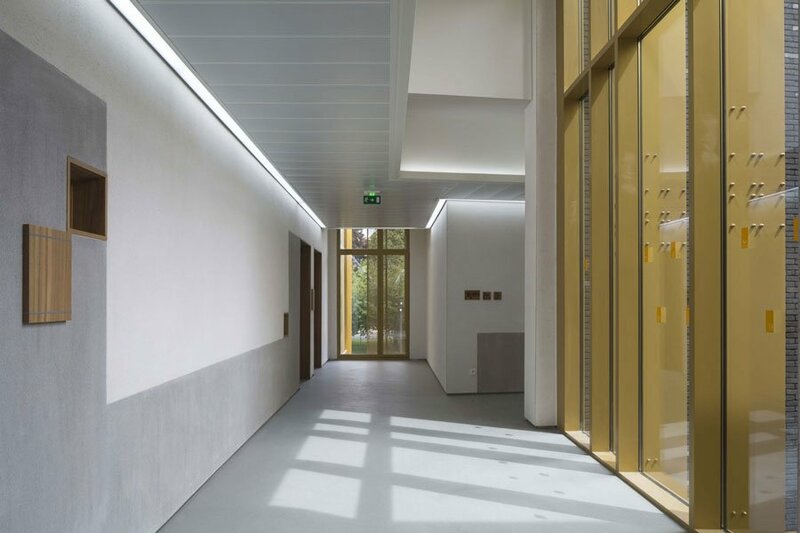 The golden light of its walls spreads gently across the sloped ceilings into the adjacent passage way that wraps around the patio and into the dance halls above. 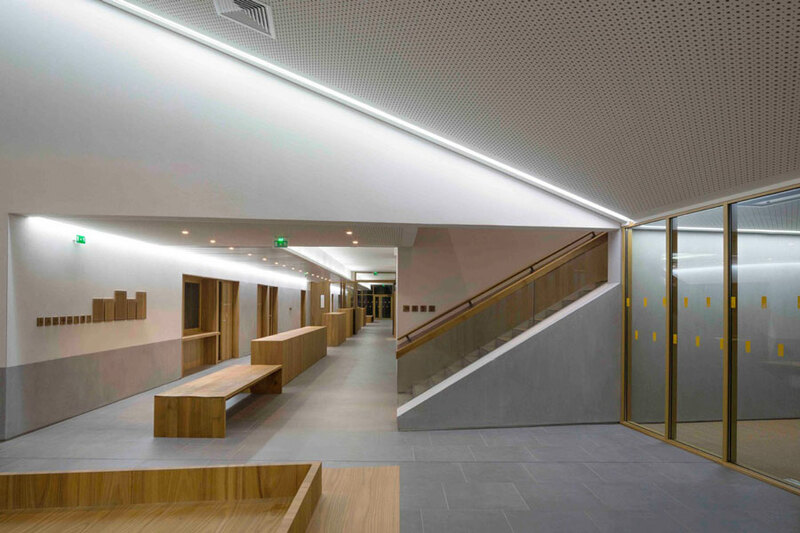 To reach the first floor, which is entirely dedicated to the dance school, visitors take the main staircase. 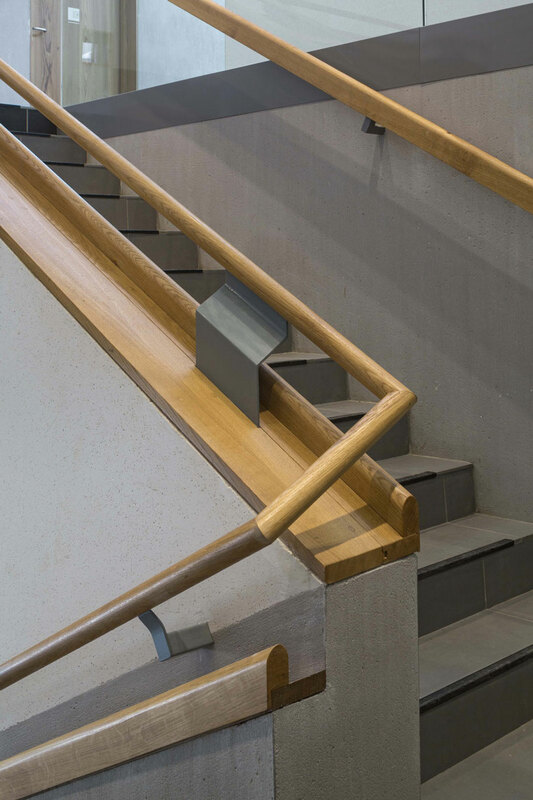 An elegant rail bannister designed by the architect combines solid oak with stainless steel. At the top of the staircase the varnished oak rail bannister continues to run around the wall section and clear glass balustrade that frames the stairwell. 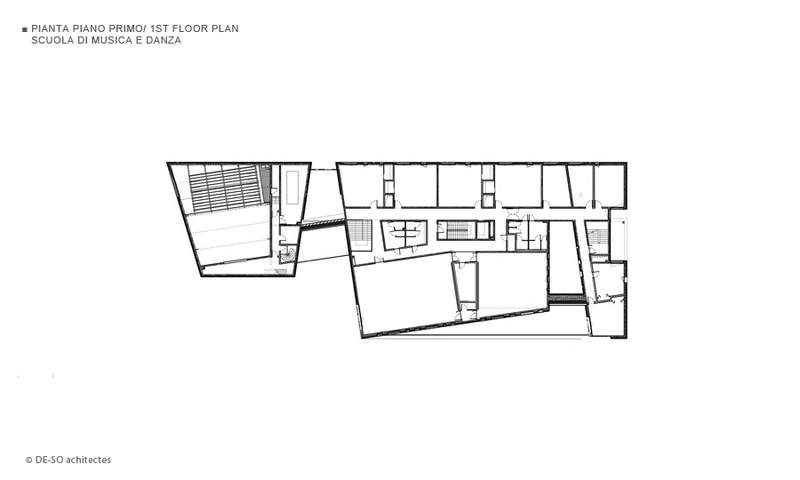 The layout of the first floor is similar to the ground floor but the main gallery is slightly narrower than on the ground floor and is bathed in natural daylight from the roof and from the bay windows giving onto to the patio. Again all the doors have laminate facing in American red elm. 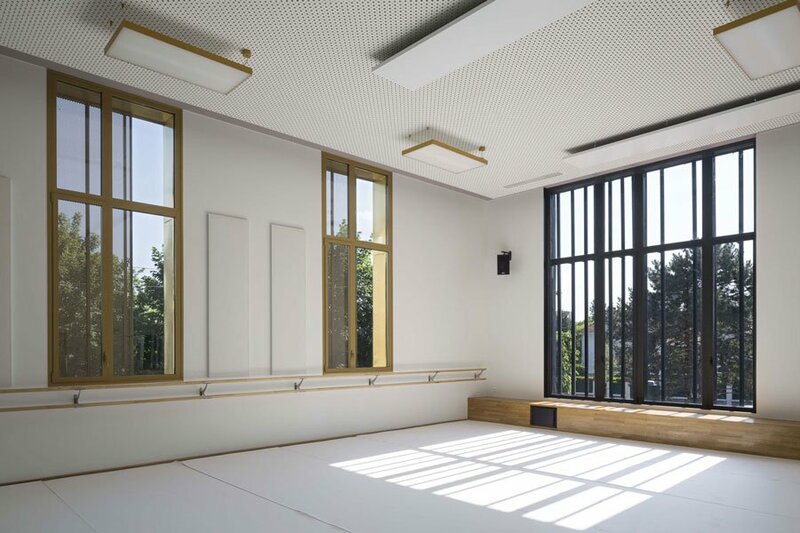 The two dance rooms have floor surfaces of 194 m² and 121 m² with tall ceilings and full height windows to provide plenty of natural daylight. The larger of the two rooms has a Junkers oak parquet floor with wide strips and an oiled finish. This façade of the first floor is slightly set back from the street which allows one of the dance rooms to give on to a roof terrace. 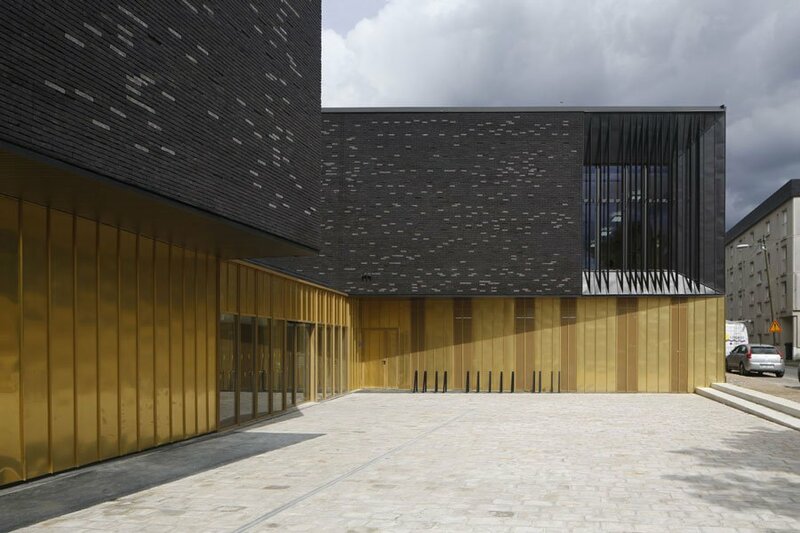 From the fine bespoke joinery in American red elm to the detailed brickwork or the gently pummelled surfaces of copper alloy cladding they all confirm that the architectural effect of this building derives from the know-how of the craftsmen who have skilfully shaped the materials.